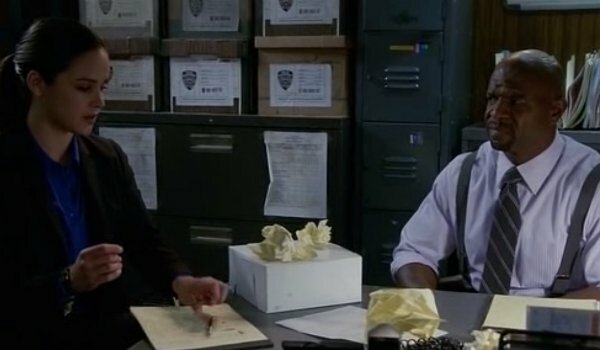 Bringing up the rear on the Brooklyn Nine-Nine greatest bets list is the series of small wagers that Jake makes with Chris Parnell’s Defense Attorney Geoffrey Hoytsman while trying to make friends with him in “The Defense Rests,” the fourteenth episode of the second season. After Eva Longoria’s Sophia puts her relationship with Jake on hold because it’s hurting her career, the latter tries to win her back by becoming gambling buddies with her boss. The plan actually goes quite well for a while as the unlikely pair bond while betting on on things like how tall Terry is in spring rolls (25) but it all falls apart when Jake catches Hoystman doing cocaine in the bathroom. Then, well, all bets were off. 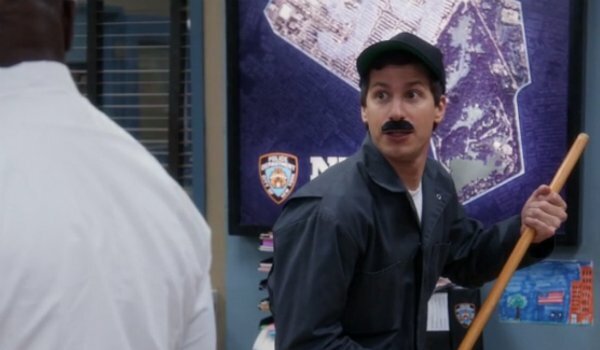 I wonder what wagers Brooklyn Nine-Nine has in store for us next season. 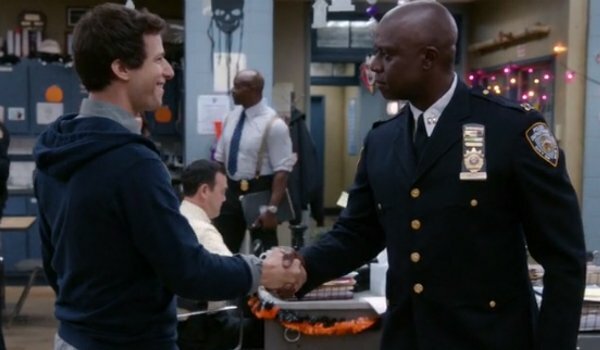 In “Captain Peralta,” the eighteenth episode of the second season, Captain Holt gives the squad (minus Jake and Charles who are busy with a case involving the titular character) a brain teaser his boss once gave him and it ends up tearing the department apart. After being talked down to by Amy and Terry, Rosa and Gina team up to solve the puzzle before them. Too bad, that even Holt doesn’t know the answer. He was hoping one of them would crack it for him. “There are twelve men on an island. Eleven weigh exactly the same amount but one of them is slightly lighter or heavier. You must figure out which. The island has no scales but there is a see-saw. The exciting catch? You can only use it three times." When the Captain and Sarge are busy with a ‘Wunch meeting’ during the third episode of the second season, the squad uses the time to hold the titular “Jimmy Jab Games.” You know what they say, “when the Ann’s away, the mice get perms.” Sorry, that’s from Parks and Recreation, the previous show from Brooklyn Nine-Nine's Michael Schur, but you get the idea. While the whole competition could be construed as a bet, the wager I’m referring to is between Peralta and Diaz with the former using the games as an excuse to get a girl’s number from Rosa. What does she get if (when) he loses? A hundred bucks and Jake never asking for another friend’s number ever. 5. Everyone v Everyone: Hot Damn! 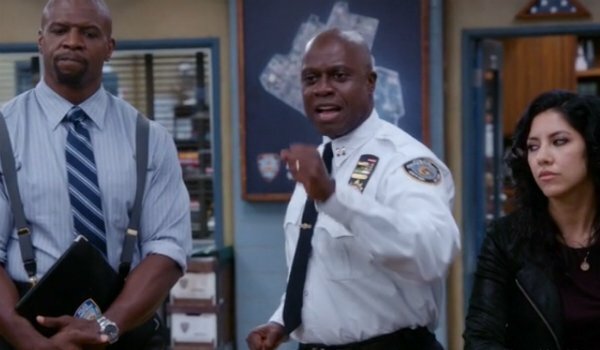 So this one might not technically be a bet since there is nothing to win or lose but there was no way the game that ended with Holt’s “hot damn!” was not going to make the cut. It’s one of the single greatest reactions ever on Brooklyn Nine-Nine and any opportunity to highlight the classic cold open will be taken. 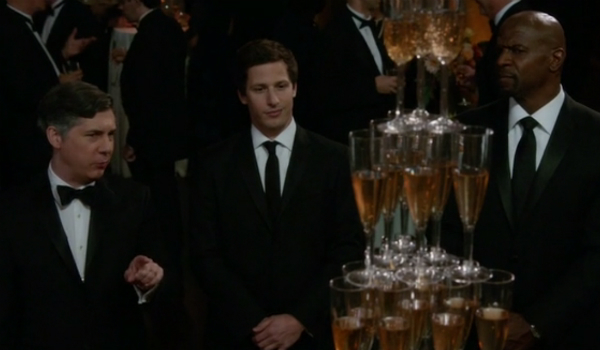 In “Jake and Sophia,” the sixth episode of the second season, Santiago is late for the first time in her career which makes most of the squad (Peralta, Diaz, Holt, Boyle, Jeffords and Gina) gather around to guess why. I was pulling for taken in her sleep. Would have made an interesting case. Bet you thought all these entries would be ‘Peralta v Someone?’ Well, to be fair, most of them are because he’s both the main and most childish character. But not the fourth greatest! 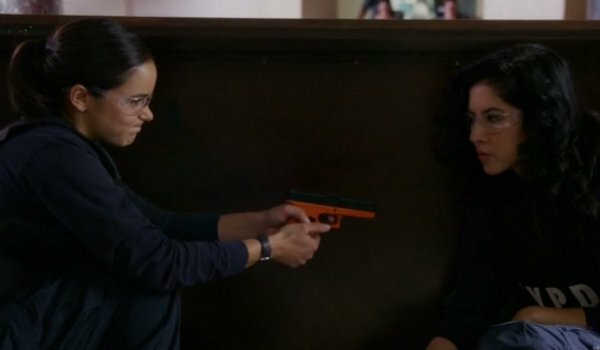 No, this is a showdown between the female leads of Brooklyn Nine-Nine. In “Windbreaker City,” the fifteenth episode of the second season, the squad are called to participate in a Homeland Security terrorist training exercise and it turns into the perfect venue for Santiago and Detective Rosa Diaz to decide who gets the weekend off. The wager is simple; the detective with the most kills wins. As you could probably tell from the introduction, the greatest Brooklyn Nine-Nine bet is the one that is set-up in the pilot and resolved in, well, “The Bet,” the thirteenth, and perhaps best, episode of the series’ fantastic first season. 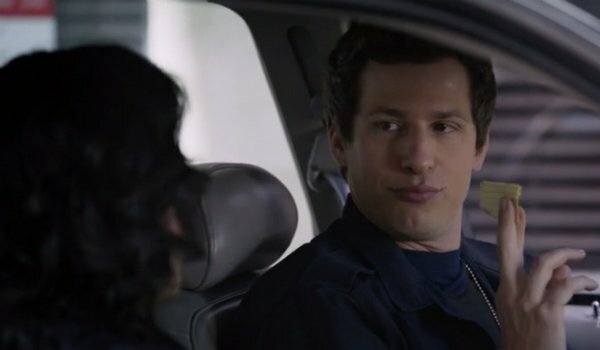 Detective Jake Peralta and Detective Amy Santiago, the comedy’s ‘will-they-won’t-they’ couple, have a competition to see which detective can get the most felony arrests and it results in their first ‘date’ - a shenanigan filled evening interrupted by a rather romantic stakeout. The bet also cleverly comes into play during the third installment, “The Slump,” to highlight how bad Jake is, well, slumping. For such a silly show the titles are incredibly straightforward.